The next level of Android's music player has been leaked onto the internet for all to see, complete with a big UI overhaul. Like the new(ish) gallery app from Google's mobile OS, Honeycomb's new music player is a big improvement on the original. Instead of large and blocky graphics that have been present pretty much since the first release, Android 3.0 will come with sliding tabs, the much-vaunted wireless streaming from your PC/Google account and improved landscape viewing. 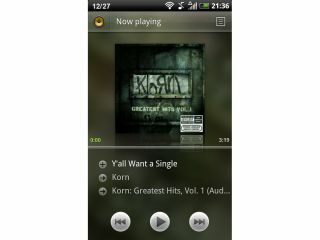 TalkAndroid and AndroidPolice are hosting the leaked file from XDA Developers Forum member johnnie93, and after TechRadar had a little play around, the next level of Android's music player does seem a cut above the previous iteration (and man, did it need it). It does lack a few things the stock Gingerbread offering gives us (namely things like being able to drag your 'Now Playing' playlist around) and the wireless syncing isn't working yet, but it's enough to get that little bit closer to the iPhone's iPod interface. Of course, most power Android users have picked their favourite independent third party application already (we're big fans of MixZing over here) but for a stock option on both smartphones and tablets, this is a nice move in the right direction for Google.